There's a new way to run cucumber-js 2.0.0 for anyone building browser applications. It's called cucumber-electron and it's available as an npm module that acts as a drop-in replacement for cucumber-js itself, supporting the same features and command line options. 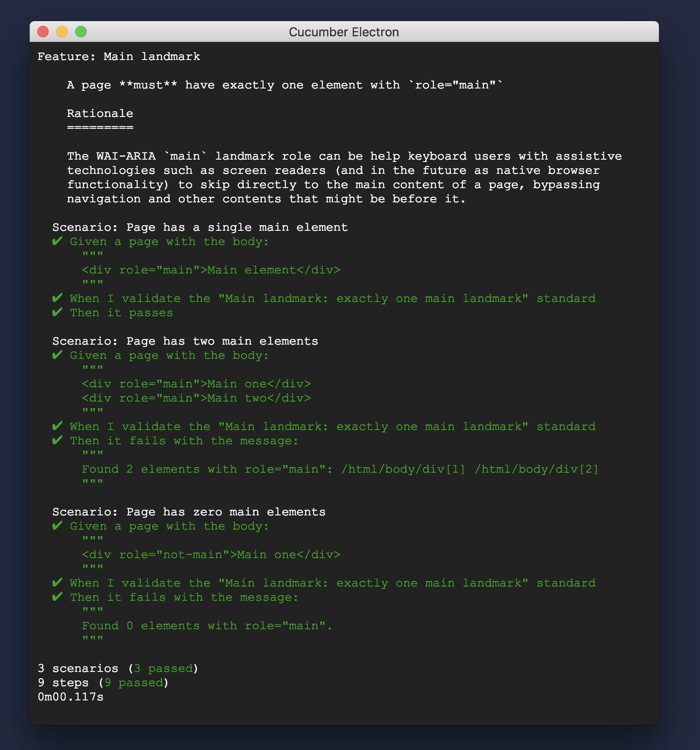 Cucumber-electron runs cucumber-js in Electron, a framework for building desktop applications in web technologies. By running features this way, your step definitions can require npm modules including server-side libraries and node.js core modules and use a browser DOM to render HTML, all in the same (chromium renderer) process, with no transpile step. This approach is a compelling alternative to using a frameworks like Selenium WebDriver, which automate real browsers like Chrome and Firefox, or even tools like PhantomJS which automate a headless virtual browser. Because there is only one process, scenarios run much faster and debugging failures is significantly simpler. It's also possible to write synchronous step definitions for manipulating and asserting about the DOM, which tend to be more reliable and easier to write than their asynchronous equivalents. Finally, cucumber-electron can be launched in "headed mode" and the familiar chromium developer tools can be used for interactive debugging of your web app. It's already being used to drive the development of a few substantial projects including bbc-a11y, an accessibility linting tool for web apps. Try it on your web app project and let us know how you get on!